M.Sc. Ph.D. (Microbiology, University of Poona, Pune), First Post Doctoral (Institute fur Mikrobiologie, Georg August Universitat, Gottingen, Germany, DAAD Fellow). Starting with initial work on Single Cell Proteins (SCPs) , Yeast Diversity and Systematics (Doctoral) , Dr. Rale shifted to anaerobic " world" during his first PDF at Gottingen working on intricacies of acetone-butanol fermentation using whey as a feedstock. Upon his return to Abasaheb Garware College, Pune, he was invited by University of Pune to an initial assignment as Reader and eventually as Professor and Head of Microbiology. In a short time span of 10 years his humongous contributions elevated the Department from an incipient stage to world-renowned status. Dr Rale subsequently enjoyed several major and minor postdoctoral and consultancy stints in Germany and United Kingdom in diverse fields including indigenization of biotechnologies. 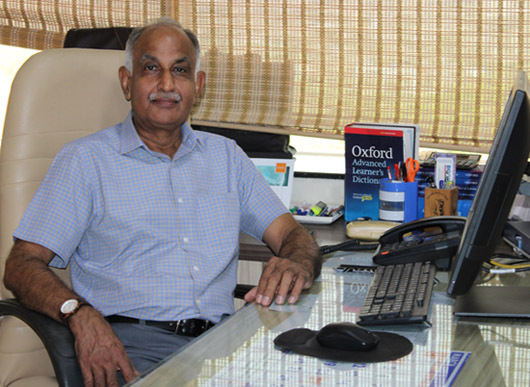 Subsequently, Dr. Vinay Rale started his own enterprises in the core Microbiology (Consultancy, Production of Microbial Biomass , Technology Development and Knowledge Transfers ,etc) and Food Sciences (Fruit yoghurts, Spreads, Fruit Preserves , etc. , first-time import substitutes in India) arenas which achieved prominence and recognition in the industrial fields. Continuing his interests in the 'practicing' world, Dr. Rale reentered into research and academics in 2008 with stints at Deccan Education Society, Pune, as Research Director with multiple responsibilities and later shifted to Vidya Pratishthan's School of Biotechnology, Baramati, before joining SSBS. Dr Rale delivered ably in both the organizations. With versatile and rich experience spanning over 40 years - in teaching, research, administration, marketing, and techno-entrepreneurship and an excellent interface with premier teaching and research institutes and diverse industries, Dr Vinay Rale is back again in a new challenging role as Director of nascent Symbiosis School of Biological Sciences (SSBS) ( formerly School of Biomedical sciences) since November 2014.